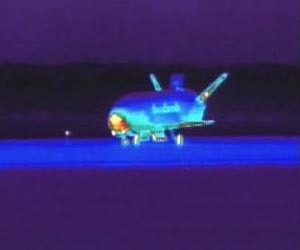 Since all the information about the X-37B is classified, mass media have little to say about it. The American secret X-37B unmanned spacecraft has broken its own longevity record by staying in orbit for more than 469 days.The spacecraft was launched in December, 2012, and remained in orbit ever since. The X-37B aerodynamic design was derived from the Space Shuttle, and it was also built with the idea of being easily re-launched after landing. The spacecraft was launched in December, 2012, and remained in orbit ever since. The X-37B aerodynamic design was derived from the Space Shuttle, and it was also built with the idea of being easily re-launched after landing. Since all the information about the X-37B is classified, mass media have little to say about it. Before the X-37B’s first launch, officials told the Christian Science Monitor that it would conduct various experiments “involving the transport of satellite sensors, subsystems, components, and associated technology” into space and back to Earth. But a recent report by the IDG News Service suggests that among other tasks, the spaceplane could be used for the goals of intelligence agencies. In 2010, John Pike, the director of a national security research organization called globalsecurity.org, expressed an opinion that the plane could be used to spy on China as a “maneuverable satellite” that could avoid being shot down. But alongside new capabilities the X-37B could give the US military, there are certain drawbacks. Chris Hellman of the watchdog group National Priorities Project believes it could also give rise to certain worries.